More than just a campsite, the gem of the Côte d’Emeraude! The 5-star Emeraude campsite is located in the heart of the town centre of the commune of Saint-Briac-sur-Mer, on the Côte d’Emeraude (Emerald Coast), in Upper Brittany. 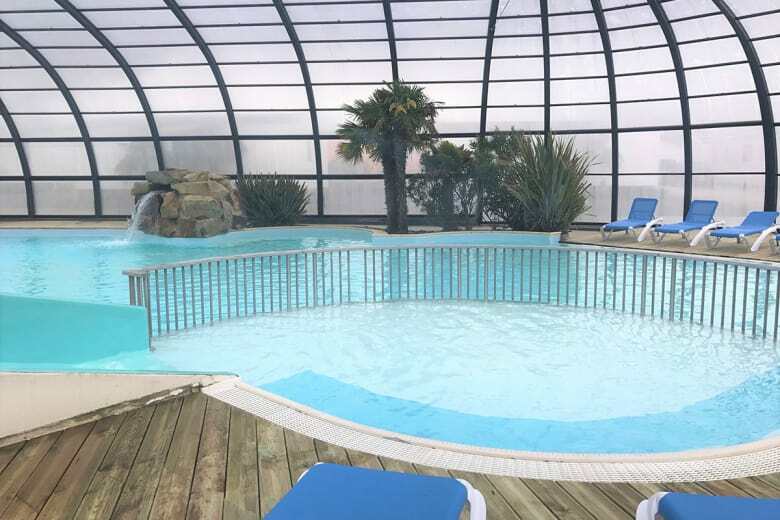 A member of the Sea Green Village group, this campsite can boast that it is amongst the most beautiful open-air hotels in the Saint-Malo area. Comfort, the quality facilities and diverse activities, everything blends into this campsite to offer holiday makers the opportunity for an unforgettable stay! This is a 5-star campsite a stone's throw from Saint Briac beach. 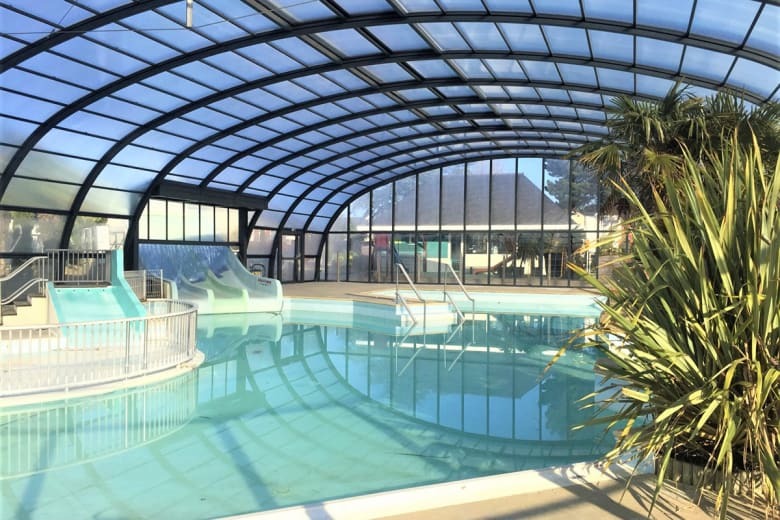 900 metres from Saint-Briac-sur-Mer beach, a seaside resort reputed for its quality of life and indeed for the multitude of celebrities who spend their holidays there, the Emeraude campsite has considerable benefits to seduce holidaymakers. Located a stone's throw from Saint Briac's town centre, it thus has numerous shops nearby. During high season, the seaside resort has two markets a week, indeed plenty to delight the curious wishing to taste the region's delicious products! This 5-star campsite in the lle et Vilaine department is located at the heart of a semi-wooded and verdant site Superbly maintained, it offers holidaymakers the possibility to set up their tent, caravan or camper on spacious turfed pitches separated from each other by high hedgerows, thus allowing each plot's privacy to be preserved. For those who prefer the comfort offered by the holiday hire accommodation, the Emeraude campsite has a wide range of cottages and chalets. Depending upon their area and layout, they can accommodate anything from 2 to 8 people. The most luxurious amongst them are assuredly the Privilège (Privilege) range of cottages. These are ultra-modern, with a well-lit designer interior, as well as a deck equipped with a garden furniture set. Amongst the accommodation within this Breton open-air hotel, there are also two types of more original holiday holiday units in the Lodge range. These are the Lodge Maori and the Lodge Coco Sweet. This is a new concept which is midway between the tent and and the mobile home. The latter allows holidaymakers to enjoy the benefits of open-air life, whilst having both a comfortable and modern a holiday hire accommodation unit. 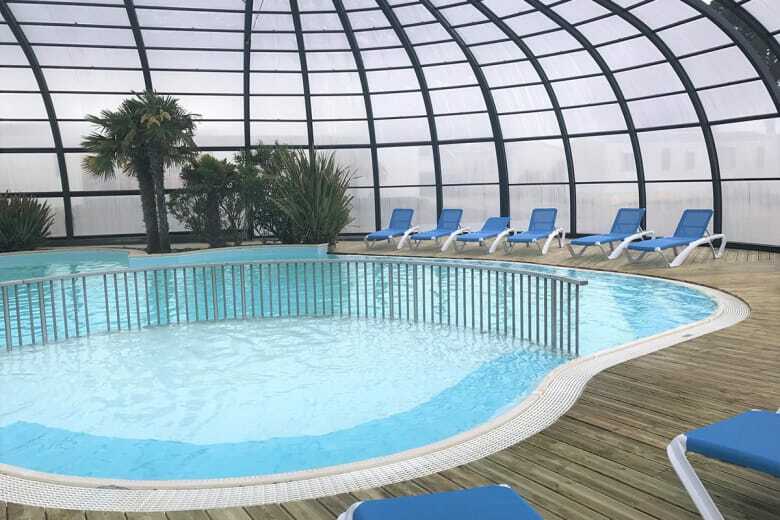 So as to facilitate not just life, but indeed the everyday life, of those wishing to spend their holiday on the Côte d’Emeraude, this 5-star campsite in Saint-Briac-sur-Mer offers a multitude of services. Amongst these services are a bar-restaurant, the terrace of which opens directly onto the aquatic park, as well as a grocery, a snack bar/takeaway, a service point selling fresh bread and sweet breads and buns such brioches, croissants and pains au chocolat. There is also a launderette, a tourist information and bike hire service, Wi-Fi coverage across the entire site and other facilities. In addition to this multitude of quality services, various items of leisure equipment and facilities ensure that everyone has the possibility for on-site enjoyment. It is, for example, the case with the Emeraude campsite's aquatic park. Fully heated, the latter is made up of a large swimming pool and a children's paddling pool. Around the pools, there are numerous comfortable sunbeds available for lovers of idleness. The campsite has saved a surprise for all future holidaymakers, with a view to making the most of the aquatic park all year round! Indeed, from the beginning of the 2017 season, the aquatic park will be entirely indoors! It is also worth noting that every morning, during the season, this swimming area accommodates water-based therapy and aqua-gym sessions. 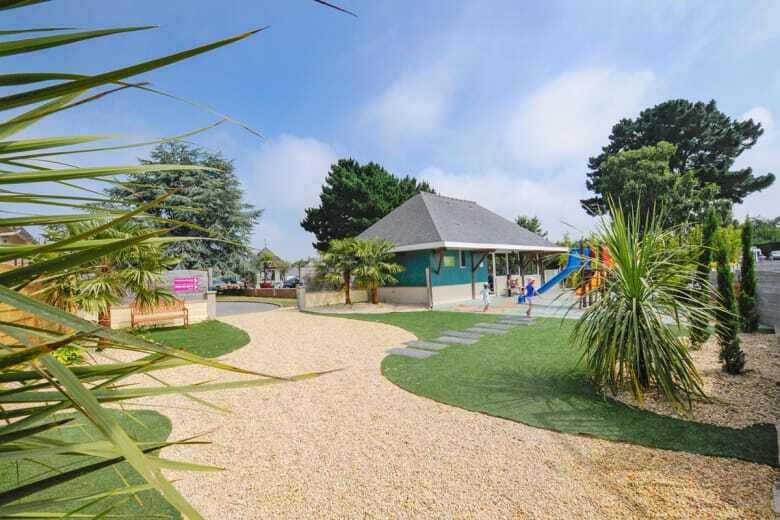 The other leisure facilities in the Emeraude campsite include a mini-golf course, ping-pong tables, an outside play area as well as a games room equipped with billiards, table football, pinball machines and games consoles. Moreover, the campsite team ensure that various activities are offered, as much in the daytime, such as Zumba lessons or pétanque lessons, as in the evening, where shows and concerts take place on the bar-restaurant's terrace! At the heart of one of the most beautiful seaside resorts in Brittany. What better than a stay at the Emeraude campsite to go out and discover the most beautiful treasures of the Saint-Malo area? Absolute heaven on earth, the Côte d’Emeraude harbours numerous remote creeks and other beaches that may be discovered during a walk or a picnic along the Sentier des Douaniers, which runs alongside the coast. Five minutes by road from Saint Briac, the town of Dinard owes its reputation to its casino, its Festival of British Cinema, but also to the superb villas built along the waterfront. Once beyond the La Rance dam, tourists are at the gateway to the superb corsair city - Saint Malo. A absolute gem of the Côte d’Emeraude, Saint Malo and its ramparts are a must-see during a stay in the region. The city and its port accommodate countless events, such as the departure of the Route du Rhum (the transatlantic single-handed yacht race), or the festivals. These are respectively the Etonnants Voyageurs (literary and film), Quai des Bulles (comic strip artists) and the La Route du Rock (rock music) festivals. Only a little further on, and the medieval city of Dinan dominates the Rance valley from the top of its fortifications. Its narrow cobbled streets and its half-timbered houses conceal surprises and there are a multitude of arts and crafts shops that have opened there! Lastly, amongst the other significant tourist sites, which are also must-see attractions close to the Emeraude campsite are the island of Le Mont Saint Michel (a spectacular medieval island commune), the medieval castle, Fort La Latte, and the Cap Fréhel (a picturesque peninsula)!